The Vivid Nicocig Rechargeable Electronic Cigarette Starter Kit provides everything you need to get started with vaping and makes a more cost-effective alternative to smoking. 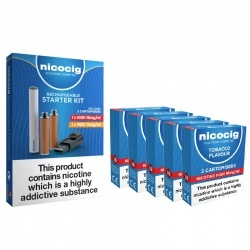 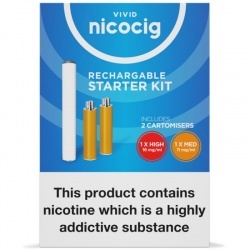 The Vivid Nicocig Rechargeable Electronic Cigarette Starter Kit with Vivid Nicocig Refill Cartridges is a product package, consisting of five packs of extra refill cartridges as well the starter kit itself. There are three cartomisers per pack, meaning you will receive a total of fifteen additional cartridges. This particular refill pack falls under the medium strength category of 11mg and is smooth tobacco flavoured.